Make the checkout fast and easy for your customers! All they need to do is to complete a simple form on just one page. The necessary blocks will be uploaded automatically during the checkout. The One-Page Checkout shows all the necessary fields on one page. It is specially designed to keep the customers focused on completing the transaction. 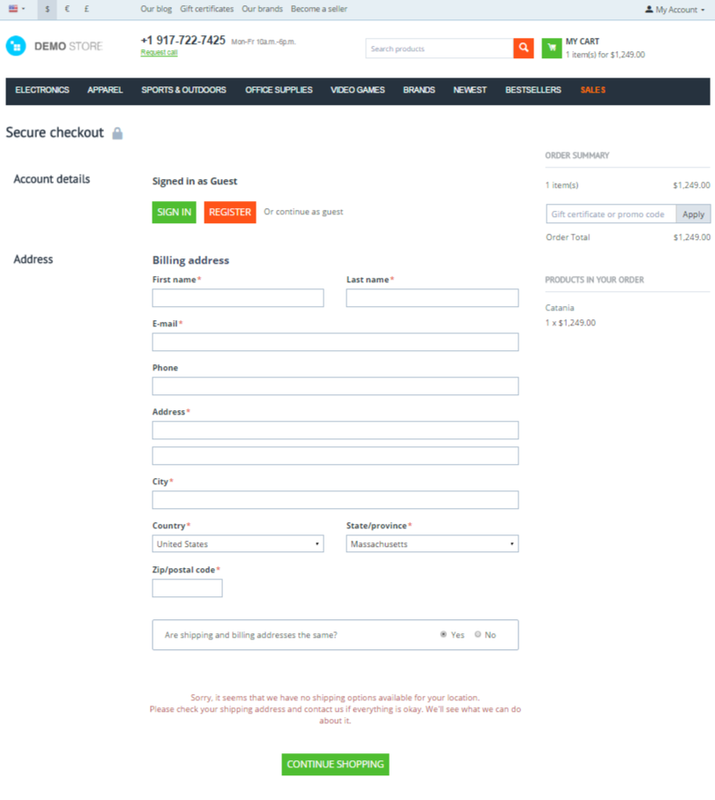 One page checkout with the Passion theme by Simtech Development Ltd. Learn more about the a dd-on in our User Guide. [!] The Terms and conditions section was not displayed on One Page Checkout. Fixed. [!] The selected payment method got reset to non-selected when choosing СDEK pick-up points. [!] The checkout fields were available even if the 'Disable anonymous checkout' setting was enabled in the Settings > Checkout page. Fixed. [!] The profile fields were not displayed on the order completed page when creating profile fields manually in the admin panel. Fixed. [!] 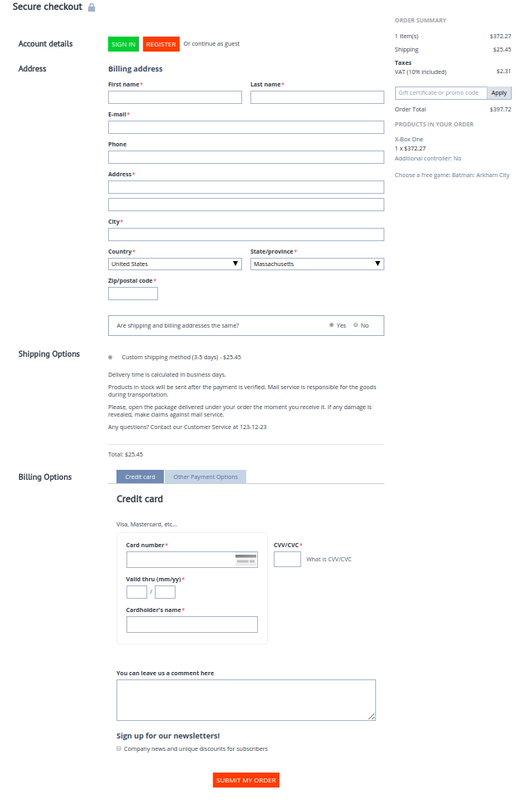 The Shipping Options and Billing Options sections were not taken into account the autocomplete address fields at checkout when enabling the Geolocation by Google add-on. Fixed. [+] The ability to show all sections of the checkout upon page load has been added (i.e. without AJAX upload). [!] Ajax was not refreshing when changing the shipment method and using Payment dependencies default add-on. Fixed. [!] Payment methods dependant on the shipping methods now load correctly. [!] State wasn't saved. Fixed. [!] A checkout error during the payment method change on CS-Cart 4.5.0. Fixed. [!] Address was deleted if the customer switched between checkout steps. Fixed. [!] 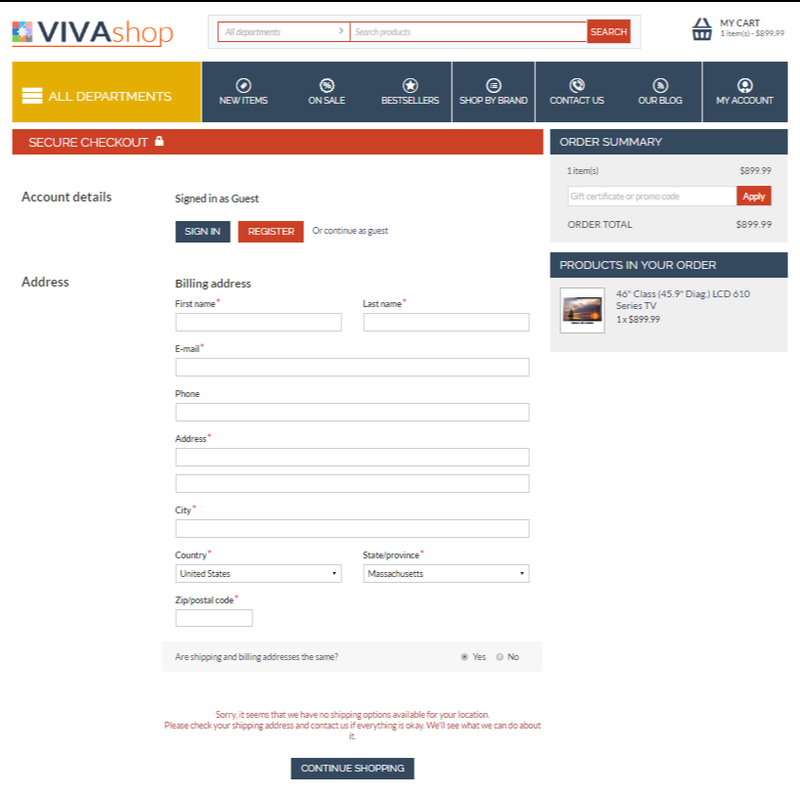 Shipping details step were missing at the checkout in the mobile layout. Fixed. [-] Shipping method unavailable notification was removed from the first checkout step. [~] The add-on was adapted for CS-Cart, Multi-Vendor 4.3.1 - 4.3.5.